Sleeping in a much larger city is comforting. Let’s say New York for instance; the city is fresh in my mind, and a string of these posts will be about this past weekend. Yes, I am back. It was necessary to take a few days off from writing, and it was important to absorb everything around me. It’s amazing how a day and a half spent in New York can be spread out through a series of posts. It’s intimidating, a good scary or scary good feeling, to think that if life was spent in such a place would open so many avenues for writing, professionally and leisurely. The emotions and perspectives were (are) not bound by walls or ceilings. The noises–people and their tones and languages, vehicles, birds, the noises from the sewers–cannot be compiled in any other form to sound more harmonious. However, it was difficult to sleep that Friday night. Friday night? Let’s be serious. I didn’t get to bed until 3:30 AM on Saturday morning. We were out and about causing havoc. Yes, well, not so much. I retired to the couch, and there wasn’t much sleep had despite its comfort level. There are plenty of reason to not make it to the alarm sounding: New Place Syndrome (yes, the subconscious feeling where you know you’re in a new place, and your body/mind agree to “screw this sleeping nonsense”), humidity and not turning on the fan, and the combination of food and booze consumed. At one point earlier in the night out, three of us decided to hit a swing set, which–while intoxicated–threw off my equilibrium even further. However, that initially happened, but I got used to it somehow. Falling asleep did occur. It was quite the fun process how I got there. My mind is quite persuasive. However, the red velvet muffins were right below the double chocolate, so one of those were scooped up instead. It was supposed to be my dessert, because I had purchased a Birds in Pear-A-Dise sandwich from Darwin, which was absolutely delicious. The sandwich is made with turkey breast, brie, pears, and raspberry mayo. This is normally not a sandwich I go for, but trying new things is a necessity. However, eating dessert before dinner is a necessity. The combination of those flavors is a perfect marriage. It’s a heavy light sandwich, and I will probably get it again. Surprisingly, after eating this while driving, no mess was made and my shirt and tie were clear of any remnants. However, the easiest way to eat the muffin was to break it apart… well, no, not so much. Crumbs flew everywhere. The sun was beaming, so there was worry that the red crumbs would get too hot and fuse into clothing. That was a wrong assumption as well, but to my liking. The smell front the sandwich, specifically the ingredients that fell onto my palm and coated my fingers, the brie and the raspberry mayo, created a unique smell. I couldn’t stop smelling my hand. I wish there was someone else with me simply because of my wanting to ask them to smell my hand. This was part of my entertainment: making jokes about my hand. The soundtrack was very slow, but great. To change it up, I put on some 311, listening to their Music, 311, and Transistor albums (yes, in chronological order). I needed pick-me-up music. However, after the three were done (there was a debate to play Grassroots, which is my favorite), the shuffle option on the iPod was clicked. If you notice the asterisk after “Table for Glasses,” the x2 is there, because shuffle played it both sessions. 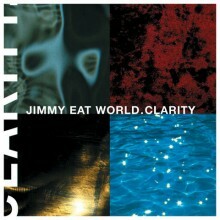 Jimmy Eat World’s 1999 release, Clarity, is one of my favorite albums. It’s probably in the Top Five, and maybe the Top Three. Fun fact. Sometimes while I am at a bar, I want to play their “Goodbye Sky Harbor” on the TouchTunes. However, the 16-plus-minute song would annoy the hell out of people. Jimmy Eat World is great make-out music. I particularly flock toward the older work, but the new stuff has the same effect. You don’t mind hanging out in the car after a date, making out, fogging up the windows. It brings me back to the ages of 17 to 22, when this sort of practice was cool, bragging rights worthy, and legitimate. At 30, there is no point and, frankly, no desire. I did what someone shouldn’t do. I anticipated the events, which would/could/should happen. This was my trying to intervene with life. What was important was that I was going to see my friends, my elementary school and high school friends as well as a museum-related friend and her companion. Yes, these descriptions are definitively simply it, but that’s going off of association. I met Justin in first grade, Joe in eighth grade (through soccer, because we didn’t go to school yet), and John in freshman year of high school. I met Becky my junior year of high school, and we worked at the Museum of Science and Technology together. We became close, and we went to Oneonta State on top of it. It’s funny to realize that it was in the cards to have this friendship, because our relationship hasn’t faltered. A couple years after we met, she met Cole; he and I met for the first time at the New York State Fair. Cole’s family, who resided in Brooklyn, people who I would later meet down the road, proved the consistency of kindness and personality. When Becky first told me about her pregnancy with her first child, it was a whopper to me. She was my first friend to have a child, and she was nervously excited about it. It was probably asked, Does Cole know?, by my person and yielded from shock. It was comforting to have her say this to me, because she admitted to not knowing how I was going to react. I was honest, and I told her that I was happy for her. I mean, she and Cole were crazy about one another. Despite my not knowing Cole that well at that point in my life, my intuition from the times hanging out with him were overly positive. He took and still takes a great interest in her. They have produced two brilliant and talented children, and I’m jealous about that aspect–my hope is to have kids like theirs one day. More about this later, but there was no way that I wasn’t going to make an effort to see them. The last time I was in New York, Brooklyn specifically, it was a great time despite not being at a great point. I walked down the stairs from my friend’s apartment to see Becky, meeting her at the coffee shop below. She knew I was miserable, and–luckily–I overcame that. Much went through my head while driving along the streets. The thoughts may or may not be highlighted in commentary, but everything should be touched upon in the upcoming posts. Thoughts could have been provoked through anticipation. The two guys in front of the store, smoking cigarettes and speaking a dialect of Spanish. There was a guy riding the bicycle, and its whirring spokes echoed as prominently as a Harley’s revving. The subway cars made the least amount of noise. The independent garage band playing through the speakers of my car, I don’t remember what the DJ said the band’s name was, was quieted so I could hear New York breathe. For a moment, I asked myself what I was actually doing here. There was the obvious reason to visit friends, and it was important to have a great weekend. These were inevitable. However, what was the real reason? I twirled the phone around in my hand as I looked down the street. Yes, he answered. Moments later, he arrived and helped me with my things–he’s a great guy. We entered his apartment. I met his roommates. They did a traditional shot of Jager. A second complimented it. The night and weekend officially began.